Chestnuts' high levels of complex carbohydrates and protein combined with low levels of fat make them an incredible source of energy. Plus, they're low-glycemic, gluten-free, paleo, and loaded with important vitamins and minerals on top of being full of unique flavor. They're also making an incredible comeback. Once coined the “perfect tree,” American chestnut trees went from one of the most popular and commonly used trees in the U.S. to almost entirely extinct in as few as 40 years due to blight. We're excited to play our role in bringing these magnificent trees back to the states. We take great pride in our orchards and care for our team, our vendors, our products, and our customers the way we care for our family. Yellow Dog Orchards is dedicated to producing the best tasting, highest quality chestnuts and chestnut based products while also taking care of our beautiful Earth. Currently, we own or manage three orchards located in the Raleigh-Durham-Chapel Hill (The Triangle) and Greensboro-Winston-Salem-Highpoint (The Triad) areas. But they won't be here long! 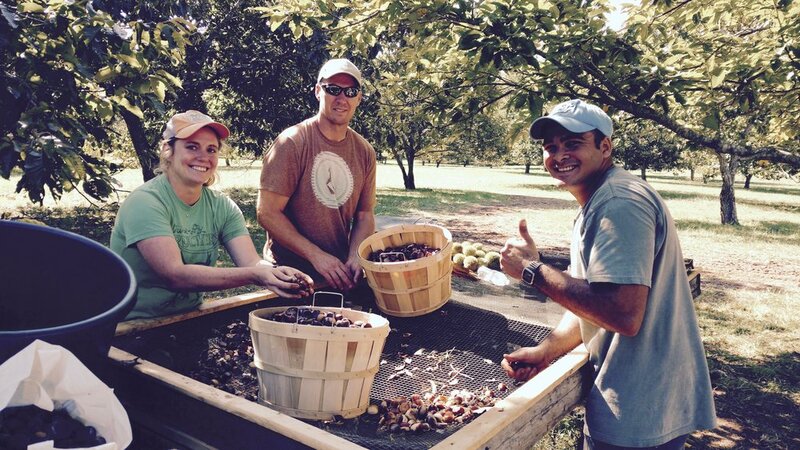 We've been busy at work harvesting the orchards, and we can't wait to share them with you. While we're still updating a list of where you can find us, keep an eye out for us at your local markets near the North Carolina Triad and Triangle areas! There's many ways to prepare chestnuts, from the classic roast to making flour. We're here to help you try them all.